Soloists Hunter Moss, Bonnie Ott, Peter Bond and Jim Brady. In celebration of Drum Corps International's 40th anniversary season, fans, alumni, current corps members, and more were treated to a special presentation closing out the DCI World Championship Semifinals on Friday, Aug. 10. 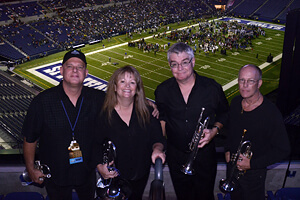 As the lights dimmed at Lucas Oil Stadium, several soloists from DCI's storied 40 years stepped onto the stage including Hunter Moss of the Spirit of Atlanta, Bonnie Ott of the Blue Devils, Peter Bond of Phantom Regiment and Jim Brady of the Bridgemen. In front of an audience of thousands, these performers lit up the stadium with strains from some of the most-loved tunes from their respective corps' histories, creating memories more than 20 years later with a whole new generation of drum corps fans. Here's a look at how the ceremony played out. Watch more videos from the 2012 World Championship on the DCi Fan Network YouTube channel.